In this hilarious romp by A.R. Gurney, author of the equally off-beat hit comedy Sylvia, we see interior decorating taken to theatrical new heights. Peggy, an idyllic upper-middle-class housewife who usually possesses exquisite taste, is overcome by a mysterious impulse to redecorate her living room as if it were a stage set. 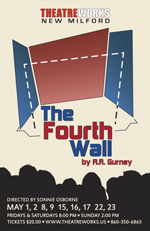 Everything faces the "fourth wall," which she's left bare. All who enter begin to behave as if they were acting in a play, or even a musical when someone feels the urge to sing a Cole Porter song. Unable to cope any further, Peggy's confused husband Roger summons an old friend, Julia, for comfort - and perhaps a bit more - as well as an aloof theatre professor who Roger hopes can "Doctor" Peggy's play and bring it to a close, so Roger and Peggy can get on with their so-called "normal" lives.